The Texas A&M softball team (17-11, 1-5 SEC) bounced back after a long weekend at Auburn, defeating SFA, 2-0, in dramatic fashion. Kelly Martinez hit a walk-off two-run home run to seal the victory for the Aggies in the 15th inning. The game was a pitcher’s duel throughout the first few innings, with Aggie pitcher Kayla Poynter (4-3) getting the start on the mound. Poynter along with SFA starting pitcher Ashley Kriesel (4-4) combined to only allow five hits in the first four frames of the game. The fourth, fifth and sixth innings, saw both teams with opportunities to score on multiple occasions, only to see both teams leave runners on base. This was a trend that would continue throughout the matchup. Poynter was dealing through the sixth inning, but in the seventh, the momentum began to shift towards the Ladyjacks. The Ladyjacks would load the bases on Poynter off of a trio of consecutive hits. With no outs, it seemed that the Ladyjacks would plate at least one run in the top half of the inning. Poynter would be pulled in favor of reliever Kendall Potts (4-4). Potts would then go on to retire the next three batters in order. The Aggies found a way to escape the seventh inning unscathed. Kendall Potts pitched nine scoreless innings in the Aggies’ 2-0 win. After a quiet bottom half of the seventh seeing the Aggies bats go down in order. The Aggies batting struggles would continue as they failed to plate runs as the game went on. The home team placed runners in scoring position in each of the first five extra innings, but would only record one hit in eight at bats with runners in scoring position for these innings. The 10th inning saw SFA once again get runners to on second and third, only to have Potts strike out two batters in a row, before she would induce an inning-ending groundout to second base. The game began to wear down both teams, as the bottom halves of the 13th and 14th inning would see the Aggie batters go down in order. The Ladyjacks would also be retired in order in the top half of the 14th inning. After fanning the Ladyjacks in order in the top half of the 15th, the Aggies would find themselves in a quick hole, after their first two batters of the inning would fly-out. With two outs, A&M shortstop Kayla Garcia smacked a ball into left field to get things going in the inning. 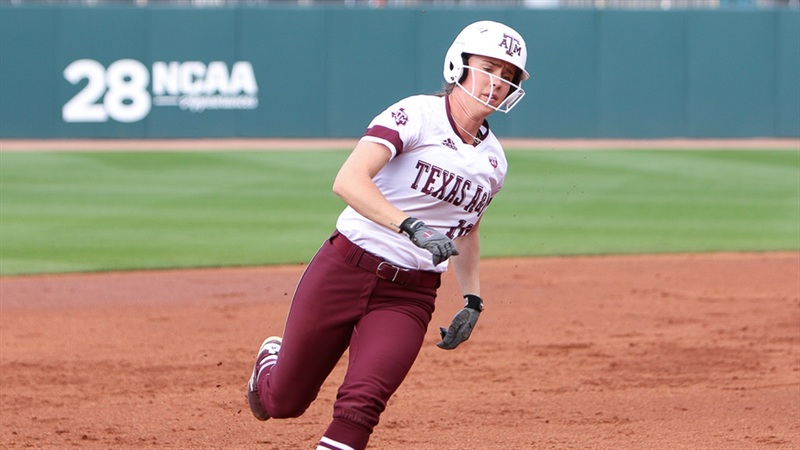 Aggie second baseman, Kelly Martinez stepped to the plate and proceeded to blast a two-run walk-off home run to seal the victory for the Aggies. “It was just me getting my timing, I knew had a good chance to get out there and do something big for our team,” said Martinez. The game was the longest A&M softball game a team has played since March of 1994. Martinez said she was glad to have found her team on the right side of history. Head coach Jo Evans added that there was room for improvement after tonight’s victory. Evans praised the performance of Potts who threw nine scoreless innings. The Aggies will look to carry the momentum with them this weekend with a three-game series against undefeated Alabama at Davis Diamond. The series is set to begin on Friday night with a 6 p.m. first pitch. The game will be streamed live on SEC Network+. Not sure how we are going to hit Bama if we can't hit SFA. In 2 of the extra innings Taudrea Sinnie reached base with 1 out, bringing Kelbi Fortenberry, to the plate. I thought Sinnie would steal second, giving 2 batters a chance to drive her in. But she didn't steal and Kelbi Fortenberry made an out both times. With the next batter, Blake-Ann Fritsch, Sinnie stole second on the first pitch both times but now with 2 out. I do not understand why she didn't steal when Fortenberry was up. Kendall Potts was fantastic, getting out of situations that a lot of times were not her fault. Glad to see Kayla Garcia get a chance. I thought Jo might make some changes to get more offense.